When thinking about Hedgehog Housing, bear in mind that hedgehogs should be housed individually, they don’t enjoy socialising with other animals and when housed with them, fights can break out. There needs to be a lot of space in your Hedgehog House (at least 4 square feet cage floor space) to explore but you shouldn’t let them run loose in your home without supervision. They can climb well and are escape artists. If they live in a wire cage or have a wire exercise wheel, they can really injure or break their little feet. Hedgehogs need plenty of ventilation but to be kept out of drafts and direct sunlight. Taking all this into consideration, the best home for your little guy is a Zoozone – large. It is big enough, tall enough, well ventilated with no wires and it’s light weight. A childrens plastic paddling pool, large plastic boxes, plexiglass aquariums, wooden cages. Remember: Whatever home you chose for your pet hedgehog, make sure it can’t escape, it’s away from other animals, it is well ventilated, it can’t climb/fall and the place hasn’t been treated with chemicals or toxic paints or varnishes. It must be easy to clean with a soft floor surface. Pelleted bedding is great for hedgehogs as does highly absorbent, shredded paper. This enables the hedgehog to enjoy hiding and tunnelling in it’s home. If your hedgehog eats it’s bedding, you need to try a different type. Alpen shavings can be used, so can vellux blanket pieces. Don’t use Terry Towels (they can choke or get their nails and quills caught in threats), Corn-cob bedding (it can cause allergies & dermatitis), Cedar Shavings (they can be toxic), Pine Shavings (Messy, dusty and can cause allergies). Hedgehogs have sensitive skin, when they have contact with moist or soiled bedding they can get dermatitis and infections. You need to clean the African Pygmy Hedgehogenvironment at least once a week and spot clean soiled areas daily. Don’t use sawdust as it can lead to infections, respiratory problems and blindness. You hedgehog needs fresh filtered water available at all times. They prefer to drink from dishes but bottles have more advantages such as a bottle can hold more water and it keeps the water clean and fresh. The disadvantages of the water bottle are that it can get plugged or leak. If you do use a water bottle, use one with a stainless steel tube instead of a plastic one and plastic can chip and it harder to disinfect. Check your hedgehog has enough fresh water twice a day.Exercise: It is essential your new companion has an exercise wheel, it prevents obesity, maintains body condition and provides social enrichment. It needs to be between 10 – 15 inches. A 12 “ rats wheel should do, depending on the size of your pet. Just like the accommodation, the wheel needs a solid floor so the hedgehogs feet don’t get caught and broken. The hedgehog will probably urinate and defecate while its running so find one that is easy to clean. A flying saucer wheel would work well too. Some hedgehogs get addicted to their wheel and spent every waking moment on it. This can lead to weight loss and health problems so deal with it by removing the wheel and only placing it back in the hedgehogs enclosure for a little while each day. Exercise Balls are not for hedgehogs, even the large ones. 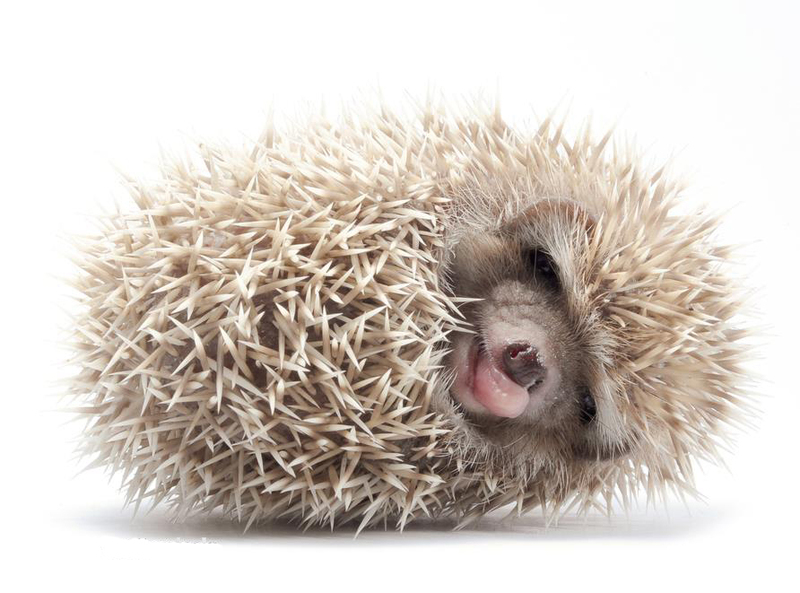 Hedgehogs don’t enjoy being confined in small places and humidity and temperature can rise quickly in these balls. Hedgehogs like exploring so giving your little friend hideaways, tunnels and tubes will keep it busy and happy. Don’t use cardboard tubes as they are likely to be made from recycled materials and can contain ink residues or toxic glues. Hedgehogs also like butting and pushing around toys such aspingpong balls. Don’t be disappointed if your hedgehog isn’t interested in any of the toys you give it, all hedgehogs are different! 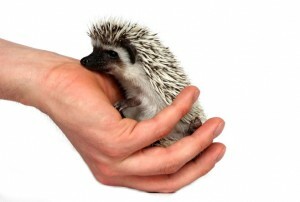 Another thing most hedgehogs like to do is carry a little companion around with them! 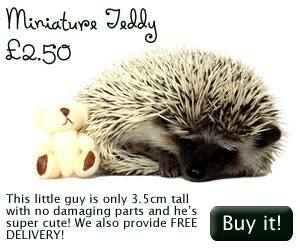 Many hedgehog owners provide their little friend with a little friend of it’s own! You must be careful when you’re choosing a soft toy for your hedgehog that it is safe. Make sure it cant chew bits off it, if it has stringy bits on, they could get caught in your pets throat, if it has beads on (for eyes & nose) your pet can choke on them. It is essential your new companion has an exercise wheel, it prevents obesity, maintains body condition and provides social enrichment. It needs to be between 10 – 15 inches. A 12 “ rats wheel should do, depending on the size of your pet. Just like the accommodation, the wheel needs a solid floor so the hedgehogs feet don’t get caught and broken. 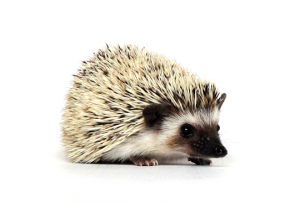 The hedgehog will probably urinate and defecate while its running so find one that is easy to clean. A flying saucer wheel would work well too. Some hedgehogs get addicted to their wheel and spent every waking moment on it. This can lead to weight loss and health problems so deal with it by removing the wheel and only placing it back in the hedgehogs enclosure for a little while each day. Exercise Balls are not for hedgehogs, even the large ones. 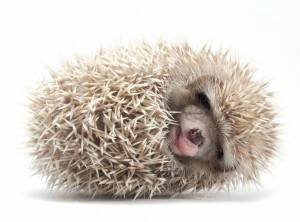 Hedgehogs don’t enjoy being confined in small places and humidity and temperature can rise quickly in these balls. An ideal amount of lighting for your Pygmy Hedgehog is 12 hours of light in the daytime and 12 hours of dark at night time. Hedgehogs need a few different places within its home to feel safe and secure in. If they don’t have access to these places they can get so stressed out they they won’t eat. You can make some hideaways from PVC tubes or ceramic flower pots. They enjoy hiding bags made from vellux and you can buy “igloos”, wooden nest boxes and artificial logs. Your pet hedgehog will be happy living in temperatures of 75-85F or 24-29C. They are very sensitive to temperature extremes and high humidity. Don’t put your pets home near a fireplace, heater or direct sunlight.. or in a drafty area. Don’t let it hibernate, ever. Hedgehogs have great hearing. This means they’re very sensitive to sound and can get startled by noise. Make sure it’s kept in a quiet place, not near TV’s sound systems, chiming clocks, doorbells, vacuum cleaners, appliances etc. Some hedgehogs will use a litter box. 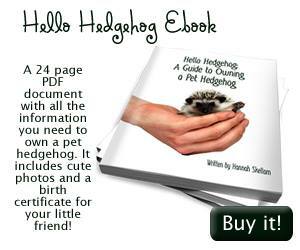 Follow these steps to train your hedgehog to use one. 1. Choose a corner litter box large enough for your pet to sit in and with one site low enough for your hedgehog to climb in. 4. Be patient. 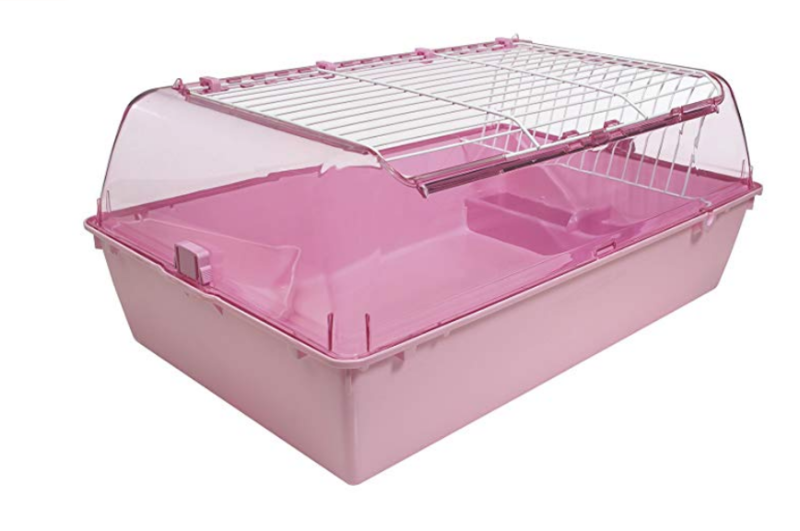 It might take some time for your hedgehog to start using it’s littler tray, or it may never use it at all. Hedgehogs often defecate when they are on their exercise wheel! It is a good idea to put your wheel in your litter tray.